Are you struggling to book a conferencing venue for your event? The venue you choose for your corporate gathering can make it a success or make it a bust. From capacity to location to amenities, what does your event need from a venue? Start by confirming the type of event you’re having. It could be a conference to teach employees new sales tactics, a product launch, etc. Narrow down the needs for your specific event. Then, seek out venues that meet your needs. Use the tips below to find a conference venue that checks all the boxes. Before you even look at a venue’s website, set the budget. Choose the number you can, in no way, exceed. It’s common for event planners to negotiate with venues. Get comfortable with negotiation and try to work out a deal. If it’s an amazing venue, suggest booking multiple events at a cheaper price. Or, insist they add other services, like catering, to the offering. Ultimately, this event shouldn’t send your company into a deficit. There are plenty of affordable facilities that will get the job done, like these venues. Will attendees be coming from out of town? Are you flying in speakers from across the country? The location of your venue matters to your guests. If you want employees to drive to the venue after work on a Friday, the shorter the commute the better. Venues close to the airport are more convenient for those flying in. The last thing you want to do is choose a venue that’s difficult to get to. Decide how many people are getting invited to the event. Then, predict how many will show up. You need these numbers when evaluating venues. Some venues can hold up to 300 people, others 10,000. Look at each venue’s indoor and outdoor capacity. They’ll also likely have a seated and standing capacity. If you plan on having tables and chairs, the seated capacity is less than the standing. Even if your event is only one day, you should still secure nearby accommodation. Attendees that are coming from out of town will appreciate prearranged lodging. Some venues have on-site accommodations, especially resorts. Consider using hotel conference spaces to take advantage of the accommodation. If people are driving to your event, there also needs to be enough parking. Overnight parking is a must if they’ll be staying at the venue’s on-site lodging. Most conferences use audio-visual elements for entertainment and speeches. But, not all venues have the equipment you need. Check that they have AV equipment. They should also have stage space, microphones, and speakers. WIFI is important to your guests and for your own production. Ensure that the venue has a strong and secure internet connection you can use. And, make sure it’s included in the price. Note where the plugs are so you can set up charging stations. Your guests will appreciate having a designated space for charging their devices. Some venues come with in-house catering. The chef might have a menu they prefer to prepare. Or, they could be willing to work with you on a customized menu. Decide if catering is something your event needs. Do guests expect a full dinner or just a cocktail hour? Every event should provide some appetizers and drinks at the very least. If the venue doesn’t have in-house catering and you need it, that’ll be an extra cost. It can be more cost-efficient to choose a venue that takes care of the food for you. Besides a catering team, does the venue have servers and bartenders? The last thing you want to worry about is hiring serving staff. Venues that offer their own staff will also usually take care of the cleanup after the event. Confirm that they will provide all the staff needed for meal service. See if they have their own audio-visual technicians to take care of the technical side. If not, these are all positions you need to hire for. They might also provide the tables, chairs, and dinnerware. The more the venue provides, the less you have to plan for. Marketing materials in the venue let guests know they’re in the right place. Branded banners, posters, and signs advertise your brand and the event. They also help tell the story of your brand. Does the venue have existing digital signs you can use? Do they allow you to put up your own marketing materials? Are you confined to only put signs inside the rented room? Ideally, you want to have marketing materials outside the venue where people arrive. Then, when they enter the venue there should be signs with your branding. Choose a venue that can support your marketing needs. Planning an event can be stressful and overwhelming. Especially when you have to vet and interview every potential vendor you want to use. Luckily, many venues have relationships with various vendors they support. They endorse vendors that they enjoy working with and believe their clients will like as well. To reduce your planning efforts, choose a venue that has recommended vendor connections. They may even have an on-site event planner you can work with. Take advantage of venues that provide an event planning consultant or team. They’ve seen events go well and go poorly in their venue. They’ll be able to guide you best to make this an awesome conference. Need More Help Finding A Conferencing Venue? You want this corporate event to be the talk of the town, or at least the break room. People won’t remember the speakers or message if the venue was disappointing. Use the checklist above to find a conferencing venue that meets your criteria. Every company wants to throw the best conference of the year. It makes you stand out from the competition. Read here to learn how to beat your rivals and win the market. 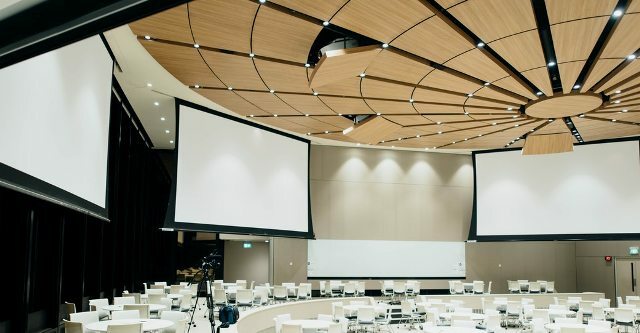 I hope you enjoyed this blog post about powerful ideas for choosing the best conference venue for your business. Interested in more articles about conferences and trade shows?